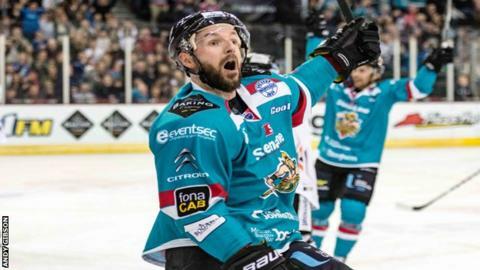 Belfast Giants moved back to the top of the Elite League thanks to a shootout win over Manchester Storm on Sunday. Ricards Birzinsh put Manchester ahead early in the first period with Colin Shields levelling for the Giants at the start of the second period. There were no more goals in normal time or during five minutes of over-time so a penalty shootout was required. Mike Radja's penalty proved enough to secure Belfast's win as they regrouped from Saturday's defeat in Nottingham. Radja's clinching goal came after Giants keeper Stephen Murphy had made a series of brilliant saves.